243 pages : illustrations ; 22 cm. 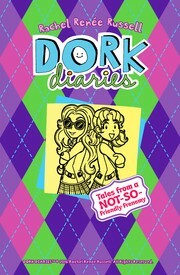 Dork diaries : Tales from a Not-so-friendly Frenemy / Rachel RenÃ©e Russell with Nikki Russell and Erin Russell. Tales from a not-so-friendly frenemy. Russell, Rachel RenÃ©e. Dork diaries ; 11. $c Statement of responsibility Rachel RenÃ©e Russell with Nikki Russell and Erin Russell. 246 VaryingTitle 3 $a Title proper/short title Tales from a not-so-friendly frenemy. 520 Summary $a Summary, etc. note Nikki and her friends team up for another adventure. 800 SAE:PersonlName 1 $a Personal name Russell, Rachel RenÃ©e.